You've heard me mention the community at Yeah Write a time or three, right? Today's View comes from someone I met there! She is Cyn of that cynking feeling, and she is participating in NaBloPoMo this month. Her post here today isn't about her View in general. It's about a specific thing. On the one hand, identifying with people featured on reality shows can be a good thing. I can be motivated to get in shape like the contestants on The Biggest Loser, catch the travel bug from the teams on The Amazing Race, or pick up some fashion tips from the hosts of What Not to Wear. 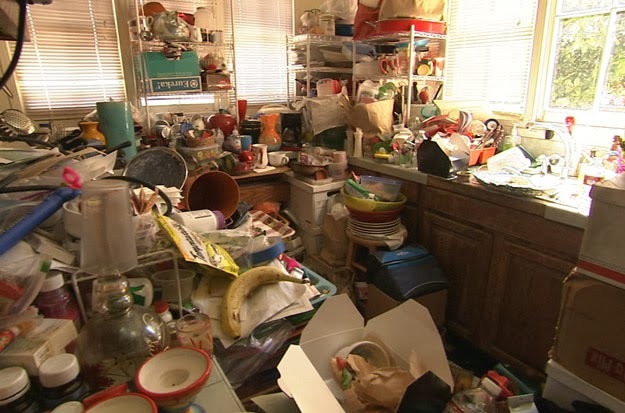 When my husband and I started watching Hoarders: Buried Alive, I was disgusted and horrified by what I saw. My first reaction was, “Thank goodness I’m not sick like that.” A few episodes in, a woman hoarding in a two story house was featured. When I saw the way she had stacks of items on the staircase leaving only a narrow path upstairs, I immediately remembered the same sight in my maternal grandmother’s home. Her place wasn’t unclean, but it certainly was cluttered. I suppose we chalked it up to living through the Depression, not wanting items to go to waste. If she were alive today, we probably would identify her as a hoarder. Having assumed that realizing my grandma was a hoarder was my epiphany from watching the show, I continued to view episodes with a bit of smugness. Sure, I felt bad for these people so attached to items that they let them take over their lives, but I knew this show was about other people. Yet, something niggled in my brain. I realized I knew someone else who refuses to throw away papers, who gets upset when others invade her domain to help her organize, someone who, so overwhelmed with how much has to be sorted, labeled and discarded just closes the door and pretends the stuff isn’t there. When watching the show, I recognized my home office: the desk is covered with papers, the filing cabinet is hidden by boxes, the cedar chests is buried under bags of stuff. The office has been the room where I put the clothes that I’m going to donate some day. Don’t know where to save this? It goes in the office until I can get around to it. Philip’s preschool papers, bills, junk mail, important documents-they are all in the office. When I need to find those items, I waste many hours and notch up my stress level upon entering the room. The home office hasn’t been the only place I stash items to deal with later. The habit migrated to drawers in the kitchen, the shelves in our living room, and my desk at work. Before you log onto the TLC website to report me as a hoarder, hear me out. To the best of my knowledge, there isn’t some trauma in my past that has led me to develop a hoarding disorder. However, I can recognize aspects of myself in the people featured on the show. Perfectionism is an ugly task master. It wants you to do everything just right, and if it’s not perfect, well, let me tell you what happens. You see . . . um, . . .
Actually, I still haven’t figured out what happens. If I’m not perfect, will the world come to an end? If I’m not perfect, will the country be plunged into disaster? If I’m not perfect, will I be unlovable? Since having this second epiphany, I’ve ventured into my office to do like the hoarders on the show: to prepare to let go. Instead of having a major haul-away, I’ve tackled a few stacks of papers at a time. I’ve shredded three bags full of outdated paperwork. I’ve filed away other documents, donated the clothes and resolved that I can’t continue ignoring the stuff. I’ve decided that it’s okay if the labels on the file folders aren’t neatly typed. It’s okay if a bill gets out of date order. It’s better to work at it imperfectly than to not work at it at all. While I still get queasy when the cameras pan over a hoarder’s house filled with rat droppings and mold, I try to get less judgmental. Instead, I look to be inspired when I see a house filled with stuff cleaned out to reveal a beautiful home. That’s what I want for myself. I don’t want to hide my imperfections under junk. I don’t want to be buried alive. I don’t want to recognize myself in that show anymore. Yeah. Me neither! I can't even watch that show. Seriously. I think I'd rather be in ignorant bliss.